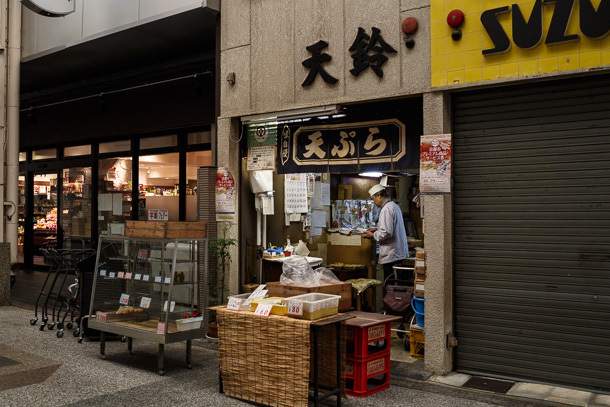 Over the past three years, I’ve researched, photographed and written extensively about the Demachi Masugata Shōtengai (出町桝形商店街) in Kyoto and its fictional alter ego, the Usagiyama Shōtengai from the Kyoto Animation series Tamako Market and film Tamako Love Story. 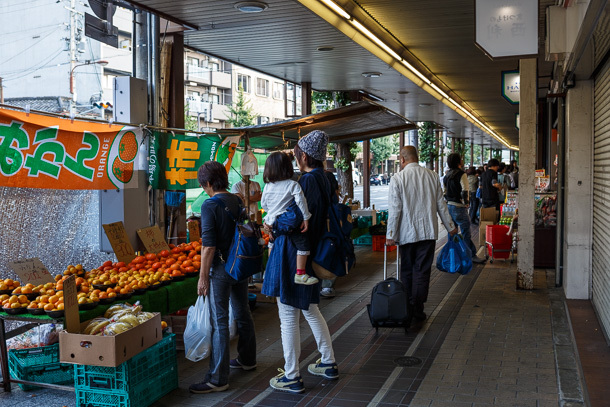 I’ve used the real shopping arcade to explain urbanism and machizukuri (街づくり town making) concepts, and show the community enriching value of what has become a disappearing way of life. 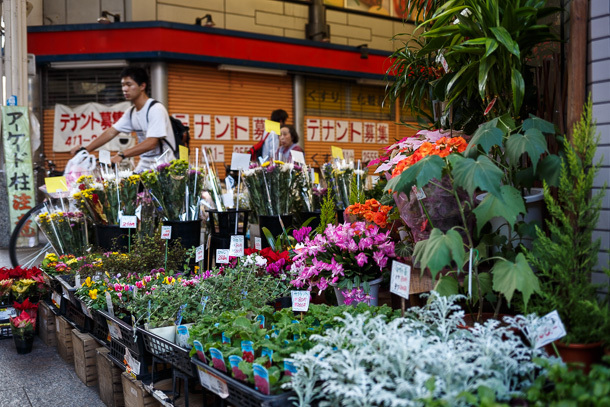 I’ve reviewed the animated works, which use Masugata as the model for their background art, to show how Japanese animation can emphasize the fine details and vibrant environment of urban commons in Japan. 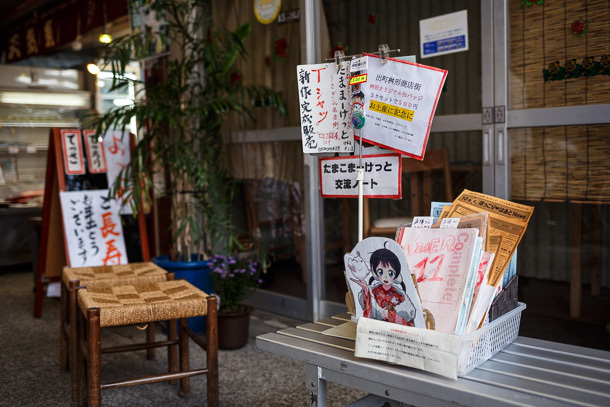 I’ve dug deep into anime fans’ seichijunrei (聖地巡礼 holy land pilgrimage) and butaitanbou (舞台探訪 scene hunting) behavior resulting from Tamako Market to explain contents tourism (コンテンツツーリズム) or pop culture tourism broadly. I’ve made many new friends in the process of all that. I generally agree that it’s good to stop and move on when you’re ahead, to not belabor the point. 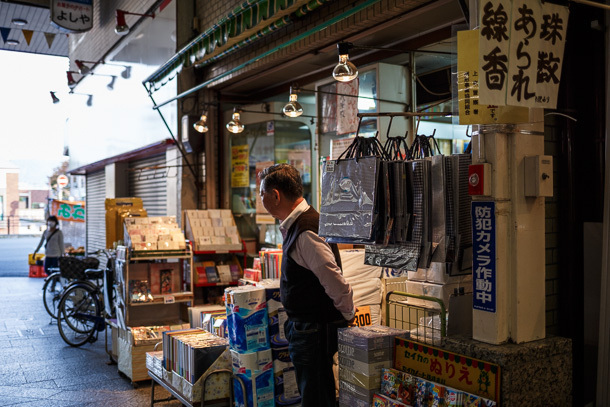 I try to keep blog articles fresh by not covering the same place more than once or twice. 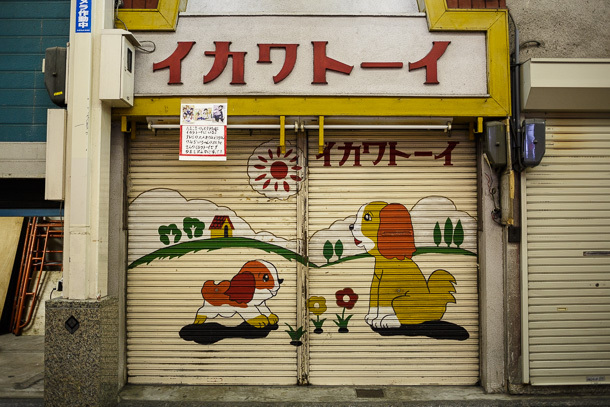 I’ve gone well past that with Masugata related matters and I do think I’ve said plenty about the history of the arcade and its relationship with the animated works. Yet, I keep coming back. I’ll always remember fondly the days of the original TV broadcast and the festival-like buzz in the arcade for the subsequent year or so, but that’s not why I continue to return. As Tamako fades in my memory, I’ve come to appreciate Masugata on its own terms. 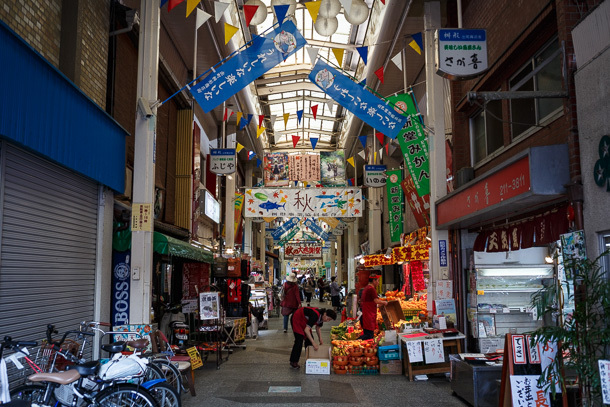 The arcade and the neighborhood surrounding it in Demachi are a great little corner of the world, the kind of place I think I would want to live, were I a Kyoto resident. I’m now on a name basis with several people who either run the shōtengai or are involved in the Demachi community in some way. 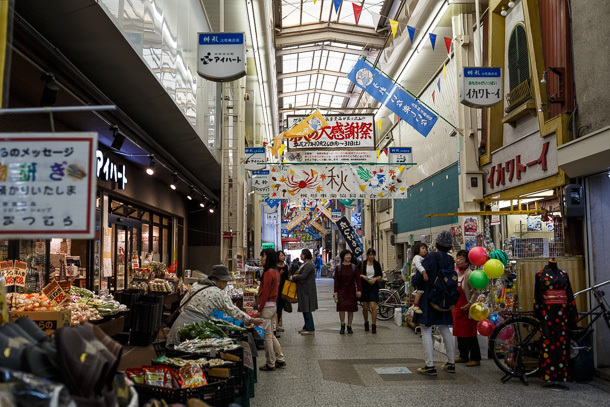 After welcoming the fan community warmly, while still holding strong to its roots, the shopping street emerges from its first 50 years as an organized entity with a renewed outlook, led by both longtime arcade institutions and young community members reviving Japan’s machizukuri tradition. 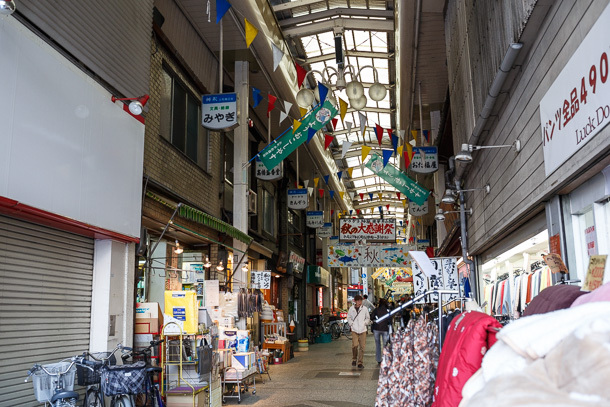 They are engaged and have many ideas about what should become of Masugata and Demachi as the arcade enters its next half century. 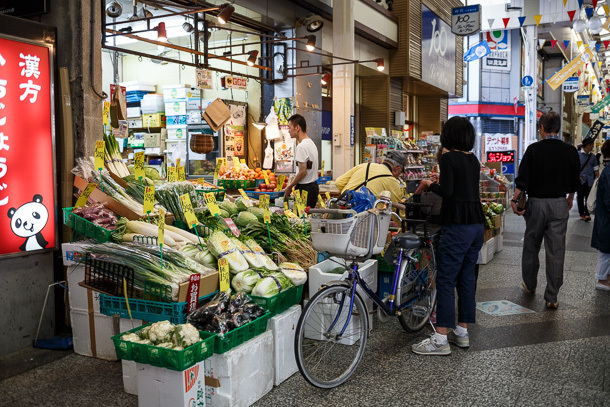 I thought my story about Masugata had mostly come to a conclusion, though it now seems as if I was only getting started. The sun sets early in the fall, turning the west entrance, Masugata’s “back door”, to gold and orange on the way to blue. 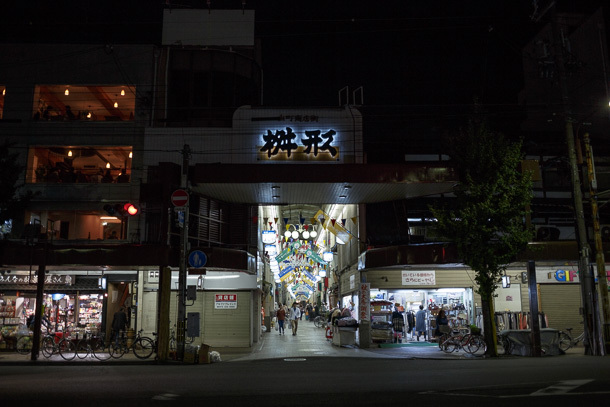 I always stay at the same ryokan a block to the west, so the smaller entrance is usually the one I first encounter each day. 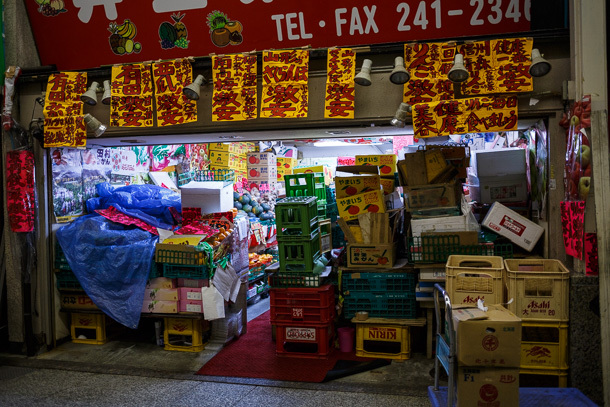 On this visit, I’ve not done a dedicated photowalk as I usually do for public spaces, instead stopping for a few moments each time I pass through. 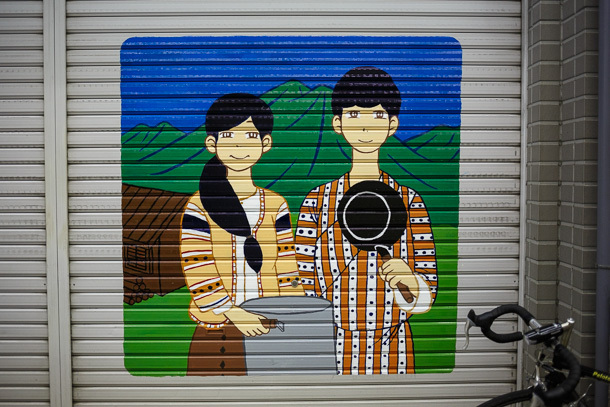 The tobidashibōya (飛び出し坊や) of Tamako and Dera is showing some weather wear on its paint. Choi gets periodic touch-ups from her creator, Tesra (@tesra1141), though she has the unfortunate luck to be covered over with promotional banners from time to time. The pilgrimage exchange notebook was up to volume 11 at the time of this visit. 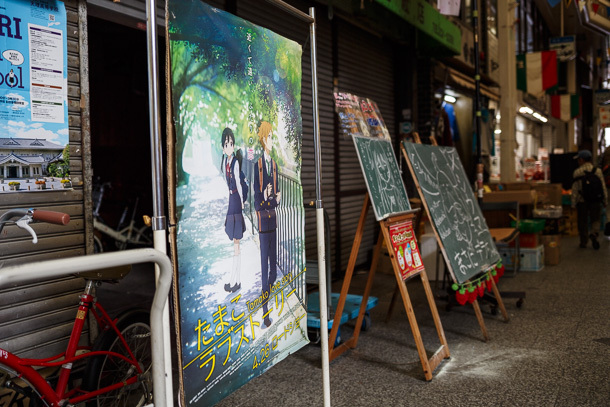 Yamada Naoko (K-On!, Tamako Market, Tamako Love Story) had recently been awarded recognition for her accomplishments as a young director. 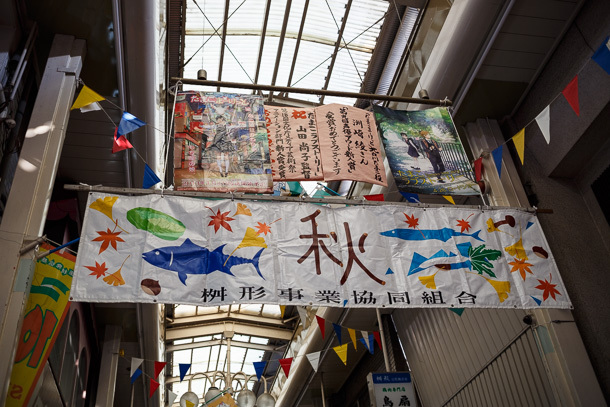 Masugata hung a hand-brushed banner, one of the arcade’s signatures, with a message of congratulations. 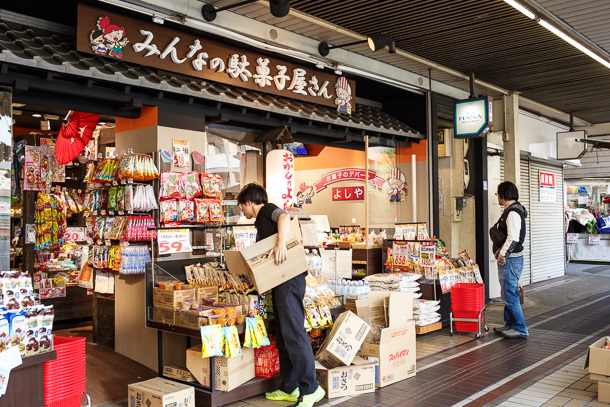 I learned that the creator of Waka Saba-chan is Fujii Eizō (藤井英蔵), the proprietor of Fujiya Katsuobushi-ten. 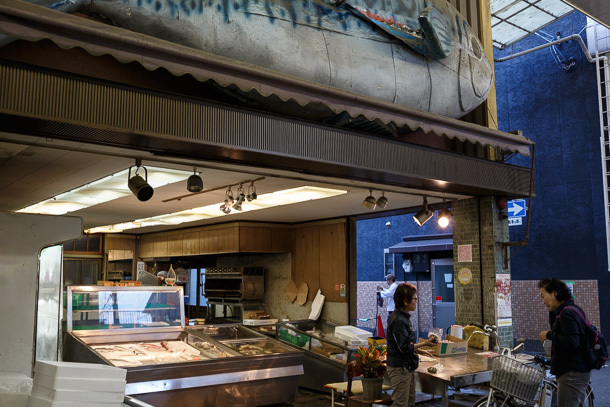 Predating this recent addition to the arcade, he also made the large foam fish above the storefront of his neighboring shop Hisaki (pictured later). 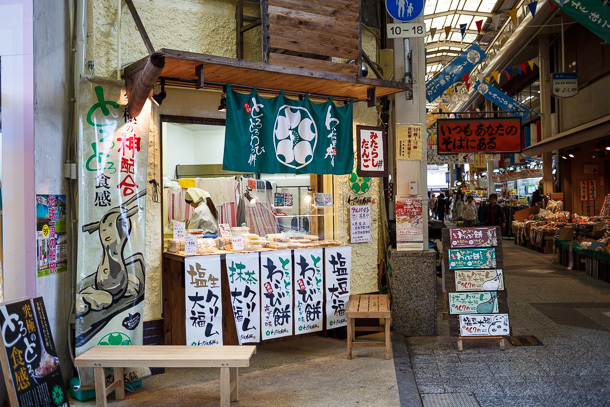 In the vacant corner shop left by Chibikara, a stand selling warabi mochi was open when I visited. I’ve heard through my social media feeds that it decided not to continue into 2016. What had been a pharmacy is now a space seeking a new tenant. There have always been at least a couple of blackboards setup in the arcade, but I noticed on this trip that they appear to be multiplying. I think this is a great thing. 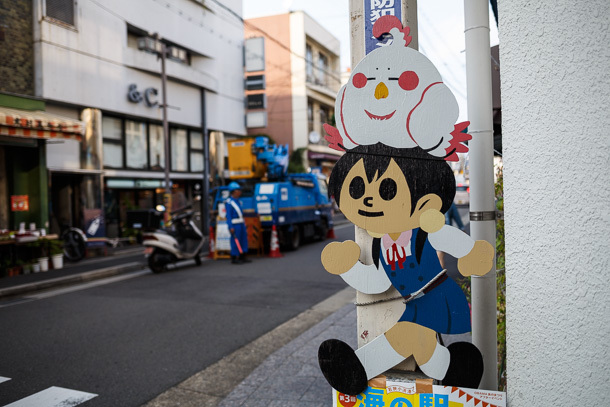 Some are notice boards from Masugata managent, some are put out by shops, and there are even public art spaces (pictured later). The smaller board on the left was actually here a year earlier. 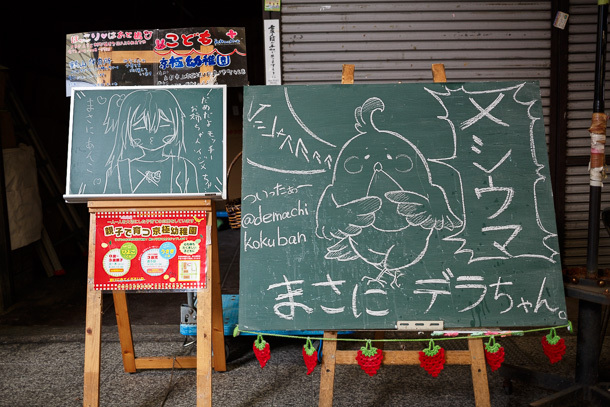 The larger one was setup in the meantime, and even has a Twitter account (@demachikokuban) that posts the changing public art and messages. 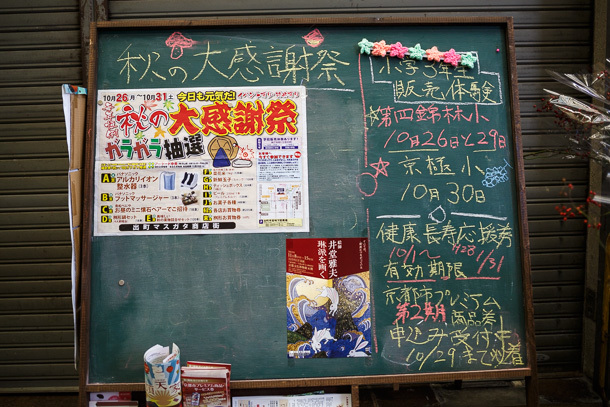 Not about to have all its thunder stolen, the smaller board rebranded itself Kokuban no kobito (Child of blackboard) and got its own account (@Demachikobito). 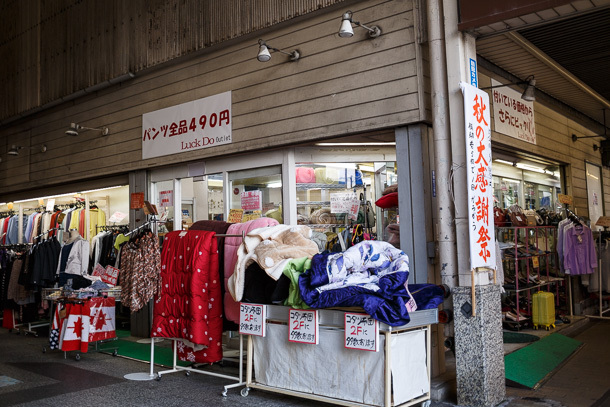 Luck Do now sells clothing and accessories where Yasumoto Books had been. 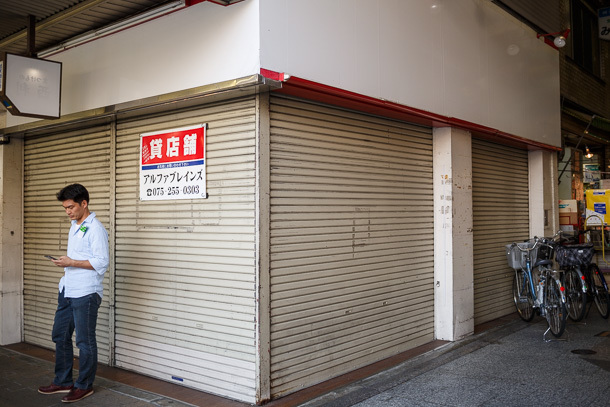 Chain candy shop Yoshiya vacated the other anchor tenant space, but did not move far. 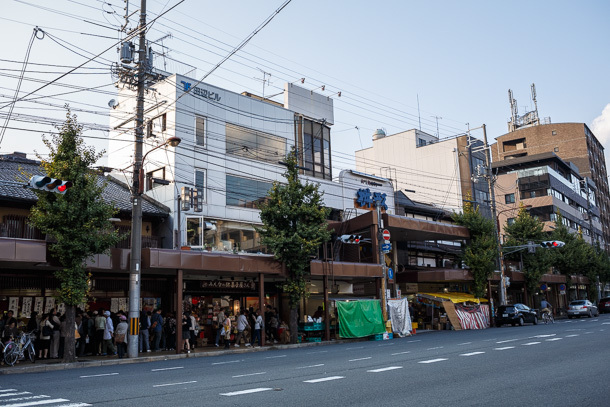 It is now one unit further down Kawaramachi-dōri. 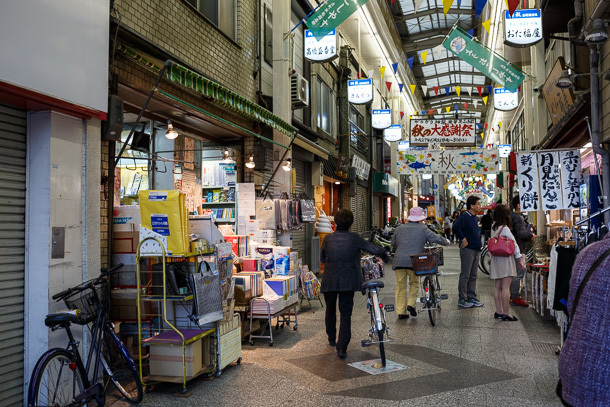 It’s technically now part of the broader Demachi shōtengai, not the Masugata arcade. 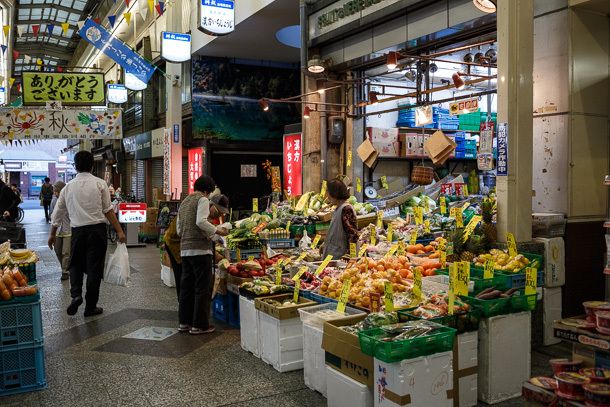 Seasonal vendors provide additional texture and a buffer from the traffic on the arterial road, extending the sense of enclosure out from the arcade. 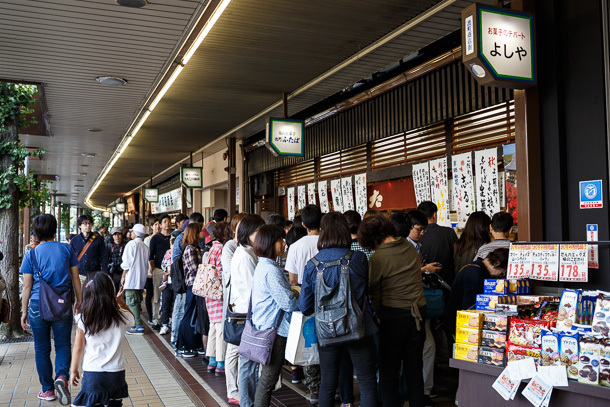 Some things can be counted on to never change, like the line at mochi maker Demachi Futaba. 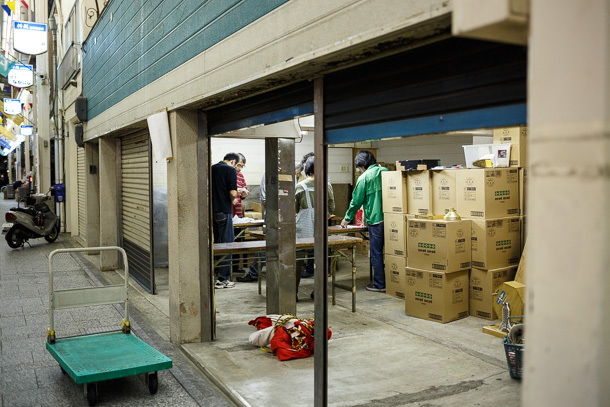 Storage space doubles as a discussion room for shōtengai management, hard at work late into the evening, after most of the shops have closed. 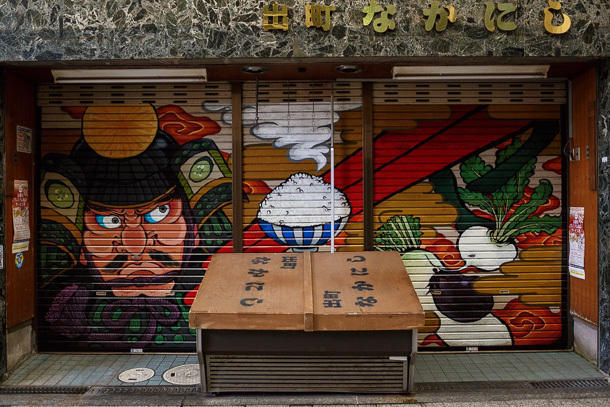 Walking through at this time is a good chance to catch shutter art. 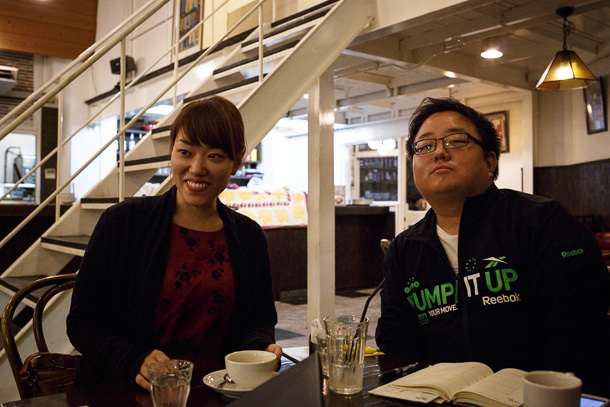 Takahashi Tomoe and Terada Aki are two of the driving forces behind the new wave of community engagement in Demachi. 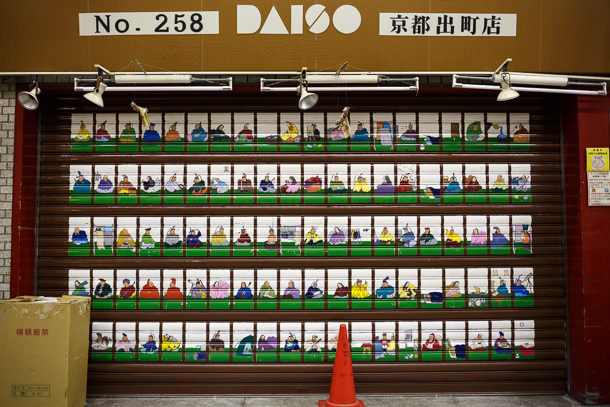 Takahashi’s parents own the incense shop in the arcade. 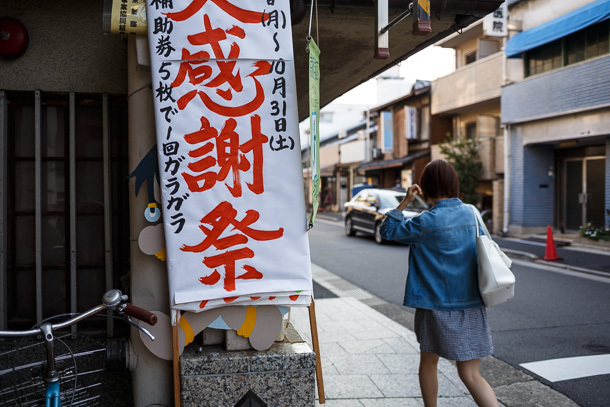 Her day job is graphic design, and the printed banners that hang in the Masugata Shōtengai are her work. She laughed at my suggestion, but she is something of a real life equivalent of the animated protagonist Kitashirakawa Tamako. 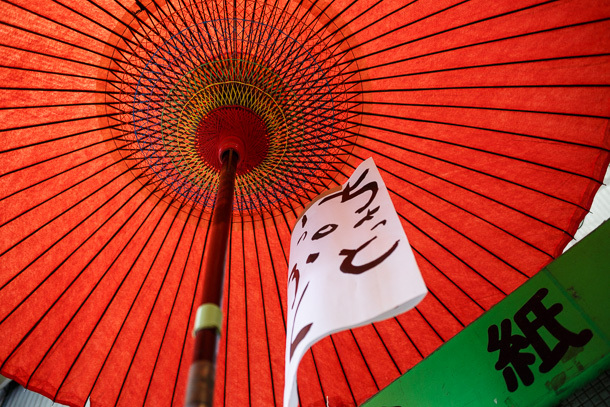 Terada currently lives in Nara, but is a fixture of the Demachi scene. 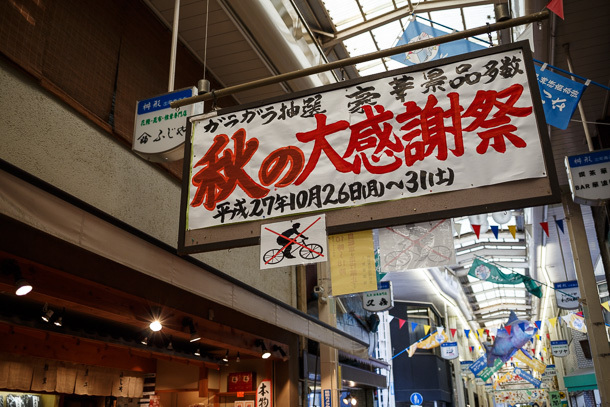 From 2016 February, he will takeover management of the Hananami cafe in Masugata. 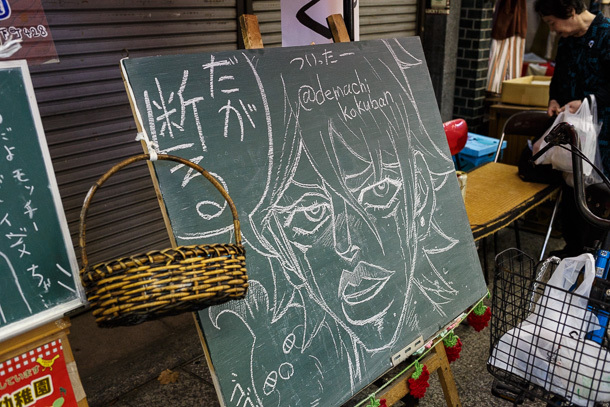 Both Takahashi and Terada are involved with Demachi Clubber (デマチクラバー), a group targeting the young adult demographic with participatory events. 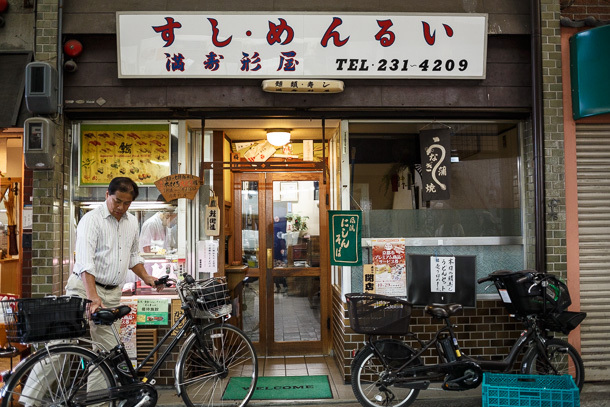 Here we’ve met at Bon Bon Cafe, at the eastern edge of the Demachi shōtengai on Imadegawa-dōri, to talk about machizukuri and public participation in Demachi. 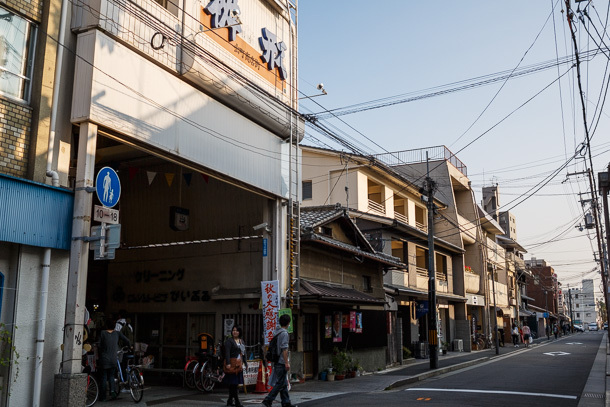 I learned that the gap between simple small talk and a discussion of urban planning and design is a pretty big one with my current level of Japanese. I hung my head and admitted that I had a long road of study ahead of me, as Google Translate won’t help me fudge my way through this forest, but fortunately my hosts were warm and had a good sense of humor. 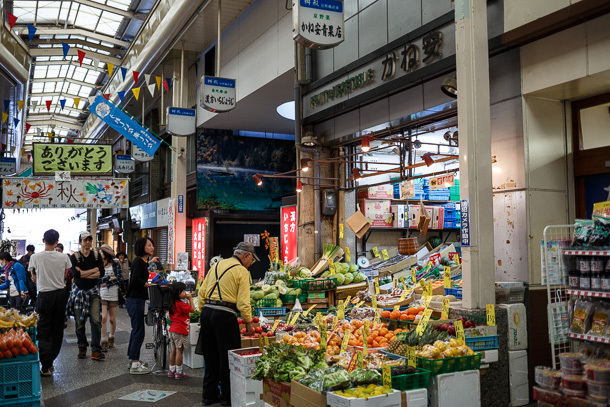 Earlier in the day, Takahashi had introduced me to Fujii and others in and near the arcade, including Inoshishi-san (猪 boar), who was introduced to me as Boar-san. 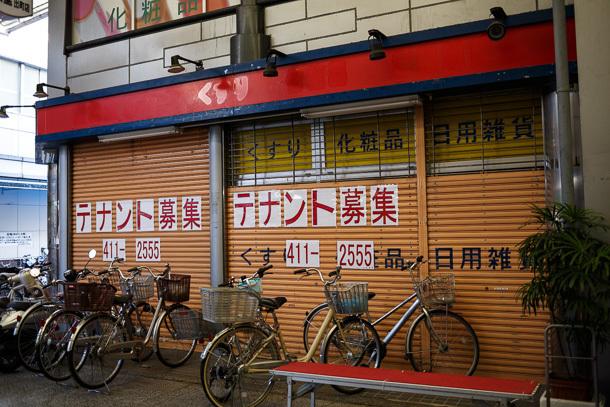 (Maybe they thought the Japanese would be hard to pronounce?) When I slipped and called her Boar-san later on Twitter, she had a good laugh and decided this should be my name for her. Like belting off-key in a drunken stupor at karaoke, sometimes making a fool of oneself helps you get closer to others. 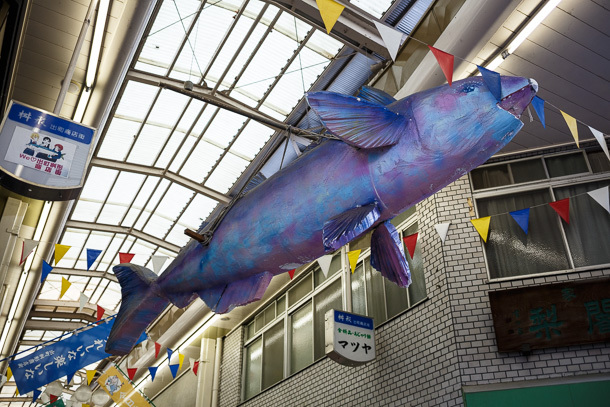 Hisaki stands proud at this corner location with its big blue fish. Shōtengai president Inoue Atsushi (left) works the lucky prize draw, part of the fall promotional event. See you next time, Masugata. You don’t need to make excuses about writing about this again! It’s nice to see true love. By the way, I finally watched the first episode of this anime. I thought I knew a lot about it from your blog already but somehow I was unaware of the fact that one of the main characters is a talking bird. I can’t remember if I brought him up or not. I think I probably treat him like a minor character, if I did. I was in the camp that thought the story could have been better without Dera. He’s no Jar Jar Binks, but does detract from what could have been a simple story about a place and the people in it. There is sort of tacit acknowledgment of this with the film sequel. Other than a “short” before the main film, Dera is absent. 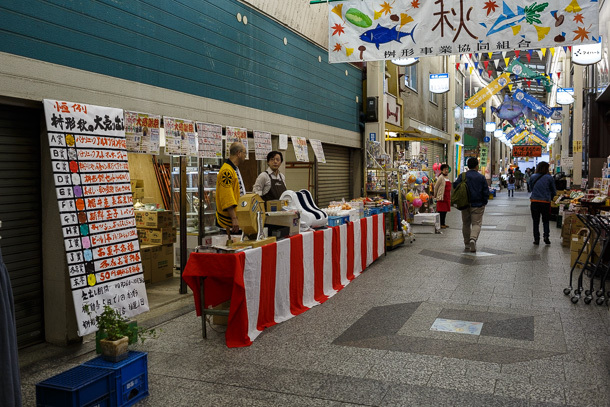 It’s funny because it’s the sort of thing I’d normally notice even if you barely mentioned it, but I guess I was so distracted by the shotengai. Anyway excellent timing for this to remind me to get around to watching it, as I am extremely snowed in and really needed it. thanks!